Objective: To examine the effect of the Baby Friendly Hospital Initiative on breast feeding rates in Scotland. Design: Observational study using an annual survey of progress towards the WHO/UNICEF Baby Friendly Hospital Initiative and routinely collected breast feeding rates gathered on the Guthrie Inborn Errors Screening card at 7 days of postnatal age. Setting: Scotland, UK, population 5.1 million, with about 53 000 births a year. Participants: All 33 maternity units with over 50 births per annum and 464 246 infants born in Scotland between 1995 and 2002. Main outcome measures: Baby Friendly status of each maternity unit at the time of an infant’s birth: certificate of commitment, UK standard award, and breast feeding at 7 days postnatal age. Results: Babies born in a hospital with the UK Baby Friendly Hospital Initiative standard award were 28% (p < 0.001) more likely to be exclusively breast fed at 7 days of postnatal age than those born in other maternity units after adjustment for mother’s age, deprivation, hospital size, and year of birth. From 1995, breast feeding rates had increased significantly faster in hospitals with Baby Friendly status by 2002: 11.39% (95% confidence interval 10.35 to 12.43) v 7.97% (95% confidence interval 7.21 to 8.73). Conclusion: Being born in a hospital that held the award increased the chance of being breast fed. All maternity units should be encouraged to undertake the significant strategic and practical changes required to achieve UK Baby Friendly Hospital Initiative standard status. The purpose of this study was to assess the effect of introducing the WHO/UNICEF UK Baby Friendly Hospital Initiative on rates of breast feeding at 6/7 days in Scottish maternity units, up to 2002. We chose to measure changes in breast feeding rates using data collected at the time of the Guthrie test (6/7 days). Other datasets provide information at different time points, but the Guthrie data have the advantage of being 99.8% complete.11,12 The Guthrie dataset includes the baby’s address and postcode, place and date of birth, mother’s date of birth, and type of feeding (tick boxes for breast, bottle, and other—intended for intravenous feeding). A total of 464 246 Guthrie records for the years 1995–2002 inclusive were included in the analysis; 9333 (2%) records of babies born outside Scotland or where the hospital of birth was unclear were excluded. A further 9290 (2%) records were identified and excluded where the age of the baby at testing was less than 4 days or greater than 30 days. The remaining 445 623 (96%) records were included in the study. The available data allowed mother’s age, size of hospital of birth (number of births per year in the year ended 31/3/2001, from Information and Statistics Division, NHS in Scotland), and deprivation as measured by the Carstairs deprivation category13 to be included in the analysis. Age at test date was not included, because it was not available in 1995 or in 2000. Analysis of data for the years where they were available showed no significant effect after adjustment for other variables. 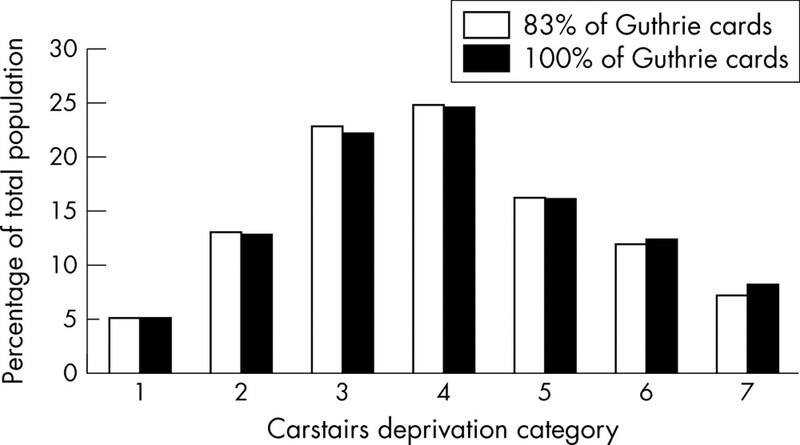 The effect of poorly completed data in the Guthrie dataset was assessed for feeding, mother’s age, and Carstairs deprivation category. Feeding was missing in 14 328 (3.2%) records. Mother’s age was not recorded in 10 502 records (2.4%). Carstairs deprivation category is postcode based, and postcode was less well completed, with 77 682 records (17.4%) not able to be given a deprivation category. Missing postcodes for 1997 data were manually completed from the mother’s address on the Guthrie card. Figure 1 shows a comparison of the data before and after completion. The difference in distribution of deprivation category before and after was small, and we have therefore made the assumption that deprivation category data from postcodes available on Guthrie cards in other years are representative of all Scottish births. Distribution of Carstairs deprivation category for those Guthrie cards for babies born in 1997 with postcode completed by the midwife (83%) and after determination of the absent postcodes from the address on the Guthrie card (100%). held no Baby Friendly accreditation. SSPS for windows was used to perform t tests to compare mean breast feeding rates, and multivariate analysis to detect association between breast feeding and Baby Friendly status, after adjustment for Carstairs deprivation category, mother’s age, size of hospital, and year of birth. Ethics approval was obtained from the Greater Glasgow Primary Care research ethics committee. Women giving birth in Scottish hospitals from 1995 to 2002 were 28% (OR = 1.28, 95% CI: 1.24 to 1.31) more likely to be breast feeding at 7 days if they gave birth in a hospital with the UK Baby Friendly Hospital Initiative standard award (table 2) after adjustment for Carstairs deprivation category, mother’s age, number of births at hospital, and year of birth. The difference is significant, and remains significant after adjustment for the confounding variables above. For all hospitals that had achieved the UK Baby Friendly standard award by 2002, the mean breast feeding rate was 41.1% in 1995 and had reached 52.5% by 2002, an increase of 11.4% (95% confidence interval 10.4 to 12.4). For hospitals without the UK Baby Friendly standard award by 2002, the mean breast feeding rate was 38.9% in 1995 and had reached 46.9% by 2002, an increase of 8.0% (95% confidence interval 7.2 to 8.7). This study shows a significant association between the achievement of the UK Baby Friendly standard award and higher breast feeding rates at 7 days. Also, maternity hospitals that had received the UK Baby Friendly standard award by 2002 had a significantly larger increase in breast feeding rate from 1995 to 2002 than other maternity units. However, we cannot be sure that this association is solely attributable to UK Baby Friendly status. Most NHS boards in Scotland have a breast feeding strategy, and in many areas a number of other initiatives, such as peer support for breast feeding, advertising campaigns, and training for primary care staff have also been introduced.14 We suggest our study be repeated over time to confirm the association we have identified. Our study is the first in the United Kingdom to use routinely collected data to evaluate an intervention to promote breast feeding. It looks to be a useful method, avoiding the cost of data collection. Unfortunately, data were not available to us for feeding at later stages, as we used the Guthrie card system collected at about 7 days postnatal age. Data are collected routinely on breast feeding at birth, discharge from hospital, and at 10 days, 6 weeks, and 8 months which may allow the evaluation of health promotion interventions on initiation and duration of breast feeding. More work is required to ensure the use of standard breast feeding definitions and to validate large datasets. However, the potential is clear. All maternity units should be encouraged to undertake the changes required to achieve the WHO/UNICEF UK Baby Friendly Hospital Initiative UK standard award in order to improve breast feeding rates and the health and wellbeing of mothers and babies. We thank all Scottish maternity units who provided information about breast feeding promotion activities. We also thank SPARKS (SPort Aiding medical Research for KidS) for funds to support our work on the evaluation of interventions to promote breast feeding. Department of Health and Social Security. Present day practice in infant feeding. London: HMSO, 1974. Department of Health and Social Security. Present day practice in infant feeding. London: HMSO, 1980, revised, 1983. Woolridge M . The Baby Friendly Hospital Initiative UK. Mod Midwife1994;4:32–3. Scottish Office. Letter from Chief Nursing Officer: CNO (94)3. Breastfeeding: Baby Friendly Initiative. Edinburgh: Scottish Office, 1994. Scottish Office. Letter from Chief Nursing Officer: SODH/CNO(96)7. UK Baby Friendly Initiative. Edinburgh: Scottish Office, 1996. Division of Child Health and Development. World Health Organisation. Evidence for the Ten Steps to Successful Breastfeeding. Geneva: WHO, 1998. Kramer MS, Chalmers B, Hodnett ED, et al. Promotion of breastfeeding intervention trial (PROBIT): a randomized trial in the Republic of Belarus. JAMA2001;285:413–20. Tappin DM, Mackenzie JM, Brown AJ, et al. Breastfeeding rates are increasing in Scotland. Health Bull2001;59:102–13. Tappin DM, Mackenzie JM, Brown AJ, et al. Comparison of breastfeeding rates in Scotland in 1990–1 and 1997–8. BMJ2001;322:1335–6. UNICEF UK Baby Friendly Initiative. Implementing the Baby Friendly best practice standards. London: UK Committee for UNICEF, 2001. Britten J, Broadfoot M. Breastfeeding in Scotland: statistical sources. Health Bull2000;58:11–19. Tappin DM, Girdwood RWA, Kennedy R, et al. An audit of infants unscreened by the neonatal screening system in Scotland during 1991. Screening1995;3:201–7. Carstairs V, Morris R. Deprivation: explaining differences in mortality between Scotland and England and Wales. BMJ1989;299:886–9. Britten J, Broadfoot M. Breastfeeding support in Scotland. British Journal of Midwifery2002;10:292–6. Fairbank L, O’Meara S, Renfrew MJ, et al. A systematic review to evaluate the effectiveness of interventions to promote the initiation of breastfeeding. Health Technol Assess2000;4:25.